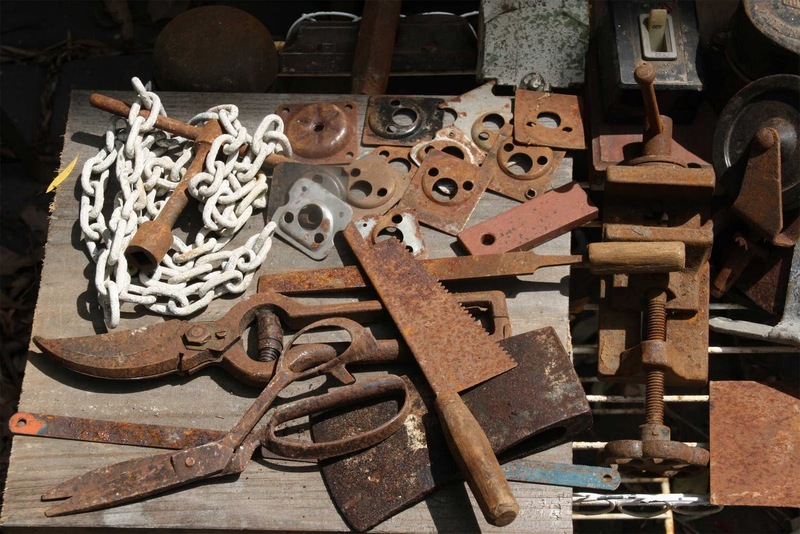 Not sure if I've mentioned my new obsession with rusty stuff but I seem to be filling up my house (competing with the piles of books) with rusty tools, circuit boards and anything that has an interesting shape. Here's a small sample. I'm resisting starting to make anything from this lot because I need to keep my studio rust free while I'm making my BAO books but once I've finished those I'll be dividing my space so I can have both occupations going at once. I've signed up for another Michael deMeng online class to start in May, on the use of tools, such as the Dremmel and heavier power tools. I was delighted this morning to see that I've won a print on Diane Lou's blog. Diane is an assemblage artist and I've recently bought her book "Transfers and Transparencies ... and other fun ways to use your inkjet printer." To quote from the back cover: "Safe, easy, non-toxic techniques that yield professional results." Suddenly it feels like Autumn/Fall and it's really delightful after all the heat and humidity. We've even had some rain so getting out into the garden is a pleasure. I planted another 100 bulbs yesterday, a little late for some of them but I'm hoping they'll surge away with the damp soil and the slightly cooler temperatures. I've planted belladonnas, daffodils, jonquils, freesias, and Dutch iris, and I have my fingers crossed for them. The Satin Bower Birds are back and stealing from the chooks. I still haven't managed to get a photo here in our garden but I did catch this male, also a Satin, when I was last in Queensland. His eyes really are violet. 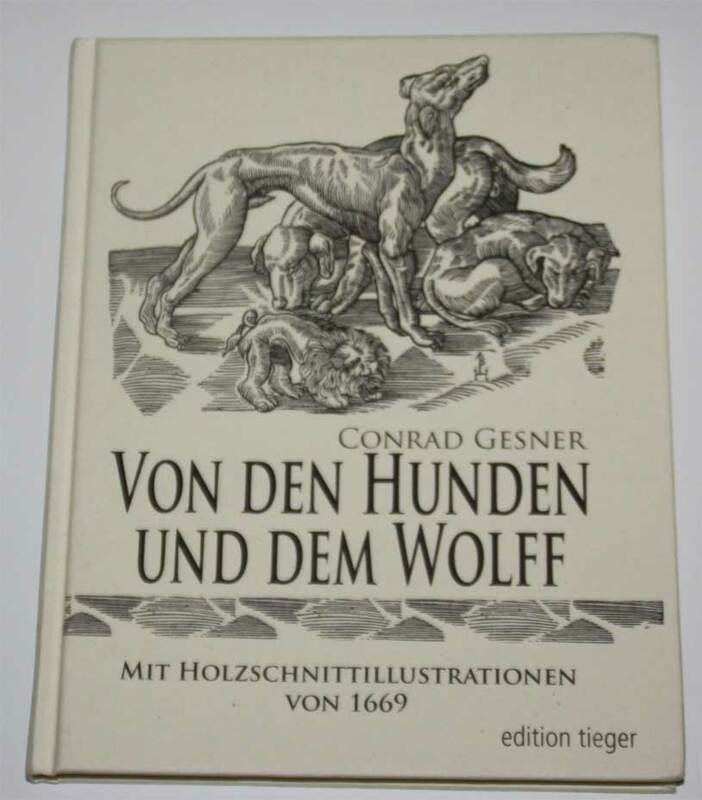 Just to add to my collection of early animal books, I purchased a copy (reproduction of course) of Conrad Gesner's "Von den Hunden und dem Wolff". Gesner [1516-1565] was a Swiss naturalist and produced encyclopaedic volumes on natural history. 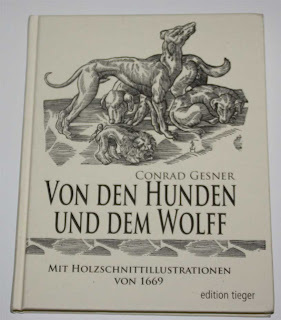 My new book is in German and shows some of Gesner's dog illustrations. 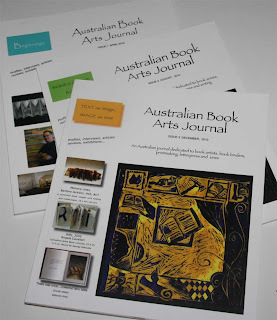 I now have four issues of the Australian Book Arts Journal, which commenced last April 2010. This is an Australian journal dedicated to book artists, book binders, printmaking, letterpress and zines. There are profiles, interviews, articles, reviews and exhibition news. Each issue has had a theme : Beginnings; Women of the Book; Text as image, Image as text; and Men of the Book. See the website for subscriptions. Daylight saving ended last night which means all the east coast of Australia is on the same time zone. I love it when it starts, and then I love it when it ends. Easily pleased, me. That bird picture is amazing. I love the way you causally say, "I planted 100 bulbs." Yay! I love seasons - all are good in their own way and yet I am always pleased to move on to the next. Sounds as though I'm wishing my life away but that's not so!! Strange to think you're getting cooler as we're getting warmer though! Your adventures in art are always surprising. Rust! I must say I hate the end of daylight saving & long for it to start again. So Carol, are you making some kind of 3D, altered book out of some of those rusty parts and printed papers? Would love to see more posts about the process. 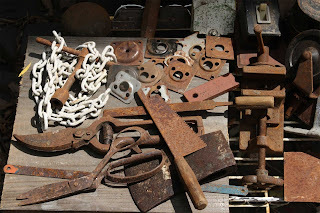 Oh I love your rusty stuff and can't wait to see what you create from it Carol. Many, many thanks for your kind comment. Ronnie: My bulbs are coming up but the rest of the garden is a bit neglected. Meg: The photo was an accident, not sure what I did to get that effect. I've now planted many hundreds of bulbs in the past two years and I look every day to see what they are doing. Gill: Lovely to see you here. I hope you are having a wonderful spring. Quirkyartist: Yes rust! I love it. It's taking over my house. Oz WS: I'm planning on using some of the smaller rusty pieces to make book covers and altered books but so far it's all in my imagination. Judy: If I could ever produce anything even remotely as wonderful as your books I'd be very happy. Barry: You are certainly partly responsible for my interest in rust. I'm not sure which way to go with it but now I have such a stash I really need to start using it. Sue: Keep watching! I'll give the link to makersandshakers on my next blog post. Hi Carol, it looks like you've been having fun! I love your photo of the bowerbird: those eyes are almost electric. Makes him look very intelligent! 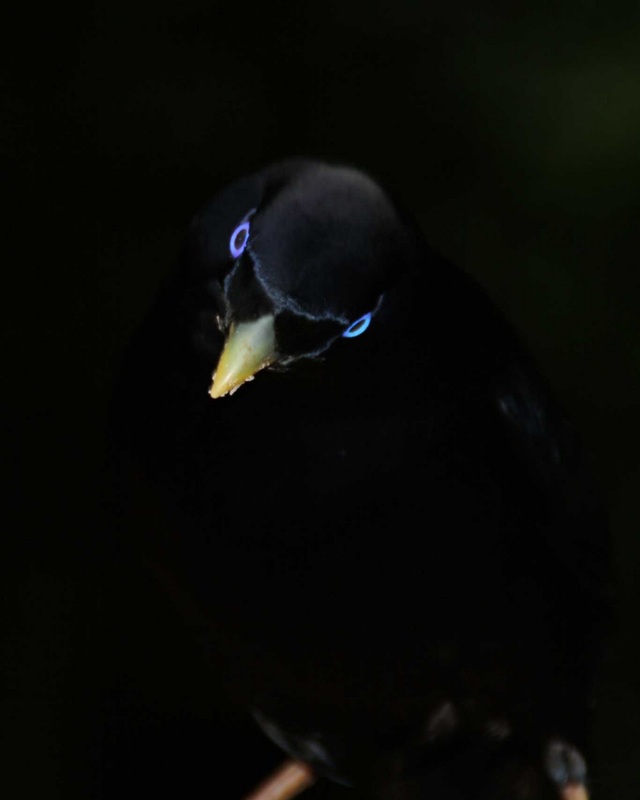 Sara: I love that photo of the bower bird - I've never been able to get a shot of the male here at home so I was pleased to get that one in Qld. G: Don't I know it. My collection of rust is spreading to every possible corner of my house. oooo!! the rusty bits are just making me drool! what a wonderful collection! i'm sure you'll come up with something cool with those. this photo of the Satin is really gorgeous!! what a beautiful capture! happy autumn and I must say it is really nice post and you hace great blog here.